"But has anything ever changed for the better in the very fabric of those ruling Russia," wrote Jozef Czapski in 1942, "have they become better, more sympathetic, more human?" What an amazing man! It is as if he could look forward seventy-odd years and take the measure of Vladimir Putin and his cronies. Born into a Polish family in what is now the Czech Republic but then was part of the Russian Empire, Czapski served briefly in the Russian Army in the First World War, then in the Polish Army against the Bolsheviks in 1920, before settling in Paris as a student of art and French literature. As a reserve officer, he served again in the Second World War, when he found himself in a Soviet prison camp. "Amnestied" in 1941 with a few hundred other officers and tens of thousands of soldiers and civilians, he was assigned the task of finding those who'd been captured with him, and who had vanished into the Gulag. 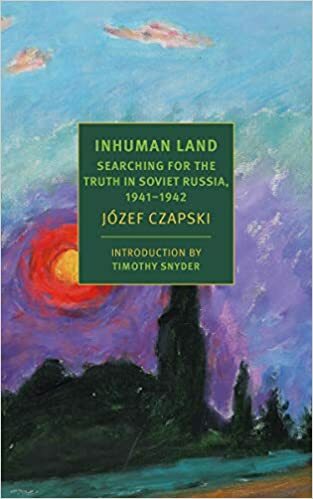 Inhuman Land is the story of that search, newly translated and published in a compact paperback by New York Review Books. It is a masterpiece and should be read by any student of Polish, Russian, or indeed world history. The editors at NYRB have done us two more favors. While a prisoner, Czapski reached back to his Paris days and prepared a lecture series on Marcel Proust's Á la recherche du temps perdu. These have now been published in a slim volume, appropriately titled Lost Time. (What time is more lost than time in prison?) More a tour de force than a contribution to the Proust canon, it is a tribute to Czapski's incredible memory, to the determination of the half-starved men who attended his lectures, and to the devotion of the two who transcribed for us to enjoy. The Second World War -- the worst thing that ever happened. It started in September 1939, with Hitler's Wehrmacht invading Poland from the west, while Stalin's Red Army stormed in from the east. Among their victims was a five-year-old named Basia Deszberg. The Russians shot her father and brother in the Katyn Forest, then loaded Basia, her sister, and her mother into a cattle car for a horrific three-week journey to the steppes of Kazakhstan, there to survive as best they could. Over the next eight years, they would escape through Persia, Lebanon, and Egypt to find safe haven in England. Meanwhile, I was growing up in a United States mired by the Great Depression. Europe's agony was America's windfall! I went from hardscrabble poverty to a college degree and a fellowship that took me to the English university where Basia was also a student. This is the story of our meeting, our travels, and our parting. "It's an extraordinary book, highly original, gripping, at once full of joy and of sorrow" (Cosmopolitan Review). Available as a paperback or an ebook at Amazon and other online bookstores. Posted March 2019. Websites ©1997-2019 Daniel Ford; all rights reserved.